This article is about the German supergun, also known as the "London gun". For other uses, see V3. For the German long-distance World War I gun, see Paris gun. For the German transport aircraft nicknamed Tausendfüßler, see Arado Ar 232. The V-3 (German: Vergeltungswaffe 3, "Retribution Weapon 3") was a German World War II supergun working on the multi-charge principle whereby secondary propellant charges are fired to add velocity to a projectile. The V-3 was also known as the Hochdruckpumpe ("High Pressure Pump," HDP for short), which was a code name intended to hide the real purpose of the project. It was also known as Fleißiges Lieschen ("Busy Lizzie"). The gun used multiple propellant charges placed along the barrel's length and timed to fire as soon as the projectile passed them in order to provide an additional boost. Solid-fuel rocket boosters were used instead of explosive charges because of their greater suitability and ease of use. These were arranged in symmetrical pairs along the length of the barrel, angled to project their thrust against the base of the projectile as it passed. This layout spawned the German codename Tausendfüßler ("millipede"). The barrel and side chambers were designed as identical sections to simplify production and allow damaged sections to be replaced. The entire gun would use multiple such sections bolted together. The smoothbore gun fired a fin-stabilized shell that depended upon aerodynamic forces rather than gyroscopic forces to prevent tumbling (distinct from conventional rifled weapons which cause the projectile to spin); this resulted in a lower drag coefficient. The origin of the multi-chamber gun dates back to the 19th century. In 1857, U.S. arms expert Azel Storrs Lyman (1815–1885) was granted a patent on "Improvement in accelerating fire-arms", and he built a prototype in 1860 which proved to be unsuccessful. Lyman then modified the design in collaboration with James Richard Haskell, who had been working for years on the same principle. Haskell and Lyman reasoned that subsidiary propellant charges could increase the muzzle velocity of a projectile if the charges were spaced at intervals along the barrel of a gun in side chambers and ignited an instant after a shell had passed them. The "Lyman-Haskell multi-charge gun" was constructed on the instructions of the U.S. Army's Chief of Ordnance, but it did not resemble a conventional artillery piece. The barrel was so long that it had to be placed on an inclined ramp, and it had pairs of chambers angled back at 45 degrees discharging into it. It was test fired at the Frankford Arsenal at Philadelphia in 1880 and was unsuccessful. The flash from the original propellant charge bypassed the projectile due to faulty obturation and prematurely ignited the subsidiary charges before the shell passed them, slowing the shell down. The best velocity that could be obtained from it was 335 metres per second (1,100 ft/s), inferior to the performance of a conventional RBL 7 inch Armstrong gun of the same period. New prototypes of multi-charge guns were built and tested, but Lyman and Haskell abandoned the idea. Accelerating gun by Lyman and Haskell (1883). Multi-charge cannon by Haskell (1892). During the same period, French engineer Louis-Guillaume Perreaux, one of the pioneers of the motorcycle, had been working on a similar project since before 1860. Perreaux was granted a patent in 1864 for a multi-chamber gun. In 1878, Perreaux presented his invention at the World Exhibition of Paris. In 1918, the French Army made plans for a very long range multi-chamber gun in response to the German Paris Gun. The Paris Gun was built by Friedrich Krupp AG and could bombard Paris from German lines over a distance of no less than 125 kilometres (78 mi). The French initiative did not reach the prototype stage, as it was discontinued when the retreat of the German armies and the armistice put an end to the bombardment. The plans for the multi-chamber gun were archived, as they had been envisioned to counter the German fire. Cönders proposed the use of electrically activated charges to eliminate the problem of the premature ignition of the subsidiary charges, the problem experienced by the Lyman-Haskell gun. Cönders built a prototype of a 20 mm multi-chamber gun using machinery readily available at the Wetzlar plant, machinery that was producing tubes of this calibre for the Flak 38 anti-aircraft guns of 20 mm. The first tests were encouraging, but to get the support of the Ministry of arms, Hermann Röchling had to present to Albert Speer Cönders' project of a cannon capable of firing on London from the coast of the Pas-de-Calais. The project intended to use two batteries to crush London under a barrage of hundreds of shells per hour, shells of 140 kilograms (310 lb) with an explosive charge of 25 kilograms (55 lb). Speer told Adolf Hitler about the proposal in May 1943. After the Royal Air Force (RAF) bombed the Peenemünde rocket center on 17 August, Hitler agreed to Speer's suggestion that the gun be built without more tests. Cönders constructed a full-calibre gun at the Hillersleben proving ground near Magdeburg but, by the end of 1943, he had encountered severe problems both in putting the gun's basic principle into operation and in producing a feasible design for the shells that it was to fire. Even when everything worked, the muzzle velocity was just over 1,000 metres per second (3,300 ft/s), which was nowhere near what had been promised. Nonetheless, a proposal was made to build a single full-sized gun with a 150-metre (490 ft) barrel at Misdroy on the Baltic island of Wolin, near Peenemünde, while construction went ahead at the Mimoyecques site in France (which had already been attacked by the USAAF and the RAF). The Heereswaffenamt (Weapon Procurement Office) took control of the project by March 1944, with no good news from Misdroy, and Cönders became one of the engineers working on the three chief problems: projectile design, obturation, and ignition of the secondary charges. 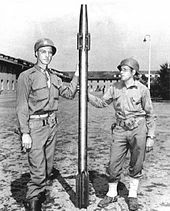 Two US Army soldiers with a captured Sprenggranate 4481 projectile, which would have been fired from the V-3 at a rate of 1 every 6 seconds. Six different companies produced satisfactory designs for projectiles, including Krupp and Škoda Works. Obturation problems were solved by placing a sealing piston between the projectile and the initial propellant charge, which in turn prevented the flash from the charge from getting ahead of the projectile and solved the problem of controlling the initiation of the secondary charges. By the end of May 1944, there were four designs for the 150-mm finned projectile, one manufactured by Fasterstoff (designed by Füstenberg) and three others by Röchling (Cönders), Bochumer (Verein-Haack), and Witkowitz Ironworks (Athem). Trials were held at Misdroy from 20–24 May 1944 with ranges of up to 88 km (55 mi) being attained. On 4 July 1944, the Misdroy gun was test-fired with 8 rounds (one of the 1.8 m (5.9 ft) long shells travelled 93 km (58 mi)). The gun burst during the testing, putting an end to the tests. Major Bock of Festung Pioneer-Stab 27 (the fortification regiment of LVII Corps, Fifteenth Army, at the time based in the Dieppe area) was given the task of finding a suitable site for the HDP batteries following Hitler's decision that HDP guns should be sited in northern France to bombard London. 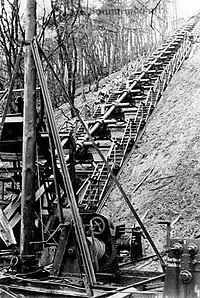 A study in early 1943 concluded that a hill with a rock core would be most suitable, as the gun tubes could be placed in drifts (inclined tunnels) and support equipment and supplies located in adjacent tunnels. The guns would not be movable and would be permanently aimed at London. A suitable site was selected at a limestone hill about 5 kilometres (3.1 mi) north of the Hidrequent quarries, near Mimoyecques in the Pas-de-Calais region of northern France behind Cap Gris Nez, very close to the French end of the present day Channel tunnel, where V-1 and V-2 launch sites were already under construction. The site was 8 kilometres (5.0 mi) from the sea and 165 kilometres (103 mi) from London. It was code-named Wiese (meadow) and Bauvorhaben 711 (Construction Project 711), and Organisation Todt began construction in September 1943 with the building of railway lines to support the work, and began to excavate the gun shafts in October. The initial layout comprised two parallel facilities approximately 1,000 metres (3,300 ft) apart, each with five drifts which were to hold a stacked cluster of five HDP gun tubes, for a total of 50 guns. Both facilities were served by an underground railway tunnel and underground ammunition storage galleries. The eastern complex consisted of five drifts angled at 50 degrees reaching 105 metres (344 ft) below the hilltop. The five drifts exited the hilltop through a concrete slab 30 metres (98 ft) wide and 5.5 metres (18 ft) thick. Large steel plates protected the five openings and each drift had a special armoured door. Extensive tunnels and elevator shafts supported the guns and, if the site had become operational, about 1,000 troops from Artillerie Abteilung 705 and supporting units would have been deployed at Mimoyecques. Artillerie Abteilung 705 had been organised in January 1944 under Oberstleutnant Georg Borttscheller to operate the Wiese gun complex. The plans were to have the first battery of five gun tubes ready for March 1944, and the full complex of 25 gun tubes by 1 October 1944. A failure occurred at the Misdroy proving ground in April 1944 after only 25 rounds had been fired and, as a result, the project was further cut back from five drifts to three, even though work had begun on some of the other drifts. The site was finally put out of commission on 6 July 1944, when bombers of RAF Bomber Command's 617 Squadron (the famous "Dambusters") attacked using 5,400-kilogram (11,900 lb) "Tallboy" deep-penetration bombs. The project eventually came under the control of the SS, and SS General Hans Kammler ordered it to be ready for action in late 1944, assisted by Walter Dornberger. A battery was constructed of two shorter V-3 guns approximately 50 metres (160 ft) long with 12 side-chambers, and it was placed in the hands of the army artillery unit Artillerie Abteilung 705 under the command of Hauptmann (Captain) Patzig. These were sited in a wooded ravine of the Ruwer River at Lampaden about 13 kilometres (8.1 mi) southeast of Trier in Germany. The two guns were aimed west, resting on 13 steel support structures on solid wooden bases on a 34 degree slope. The city of Luxembourg (which had been liberated in September 1944) was at a range of about 43 kilometres (27 mi) and was designated Target No. 305. Concrete blockhouses were constructed between the two gun tubes, as well as ten smaller bunkers to hold projectiles and propellant charges. The assembly and mounting of the Lampaden guns coincided with the final preparations for the Battle of the Bulge. The supply of ammunition became problematic due to the state of the German railway network. Time had become critical, and it was decided to use a 150-millimetre (5.9 in) finned projectile with a discarding sabot, weighing 95 kilograms (209 lb) and carrying a 7–9 kg (15–20 lb) explosive charge. The propellant comprised a 5 kg (11 lb) main charge and 24 subsidiary charges for a total of 73 kg (161 lb). By the time that the Ardennes offensive began on 16 December 1944, Kammler received orders from OB West (German Army Command in the West) to begin firing at the end of the month, and the first gun tube was ready for action on 30 December 1944. Two warm-up rounds were initially fired, followed by five high-explosive shells which were fired in sequence, attended by Kammler. The muzzle velocity was approximately 935 metres per second (3,070 ft/s). The second gun tube was brought into operation on 11 January 1945 and 183 rounds in total were fired until 22 February 1945, with 44 confirmed hits in the urban area. From the 142 rounds that struck Luxembourg, total casualties were 10 dead and 35 wounded. One of the two Lampaden guns was dismantled on 15 February, and firing ceased on 22 February, when US Army units had advanced to within 3 kilometres (1.9 mi) of the Lampaden site. There were other proposals to deploy batteries to bombard London, Paris, Antwerp and other cities but these were not implemented due to the poor state of the German railway network and a lack of ammunition. All four HDP guns were eventually abandoned at the Röchling works in Wetzlar and Artillerie Abteilung 705 was re-equipped with conventional artillery. The disassembled gun tubes, spare parts, and remaining ammunition were later captured by the US Army and shipped to the United States where they were tested and evaluated at the Aberdeen Proving Ground, Maryland, and scrapped there in 1948. The Mimoyecques museum allows visitors to view the galleries (in various stages of construction and bombing damage), remains of the guns, a small scale V-3 replica, and examples of machinery, rail systems and tools employed. The site also contains memorials to the slave labourers who were forced by the Nazis to construct it and to the airmen killed in action during the destruction of the base. The Misdroy site also has a museum. Hugh Hunt of Cambridge University, together with explosives engineer Charlie Adcock created a working scale model of the V-3 gun and was able to prove the ignition of the propellants was done by the advancing gas behind the projectile. ^ August Cönders is often incorrectly considered the inventor of the multi-chamber gun. ^ Thompson, Peter (1999). The V-3 Pump Gun. London: ISO Publications. ^ "V-3". www.astronautix.com. Astronautix. Retrieved 11 June 2008. ^ In 1938, a Czech named Tugendhat rediscovered the concept and tried to sell his "Multiplex Gun" proposal to the British, but they turned him down. ( Fitzsimons, Bernard (1979). The Illustrated encyclopedia of 20th century weapons and warfare. 14. Milwaukee: Purnell Reference Books. p. 1566. ISBN 978-0-8393-6175-6. ). ^ Ley, Willy (June 1968). "Jules Verne, Busy Lizzy and Hitler". For Your Information. Galaxy Science Fiction. pp. 72–78. ^ "Base v-3 une base pour bombarder londres". Les Canons De L'apocalypse. Retrieved 11 June 2008. ^ a b "The V3 weapon system (HDP), " High pressure pump " or " Centipede "". National Museum of Military History. Archived from the original on 22 August 2006. Retrieved 1 June 2008. ^ "V3 position in Hermeskeil-lamps". Retrieved 26 October 2008. ^ "Forteresse de Mimoyecques". basev3-mimoyecques.com. Retrieved 24 December 2007. NOTE: The length of the V-3 cannon at Mimoyecques surpassed the Schwerer Gustav (Dora) 800 mm super-cannon, the Mörser Karl (Gerät 040) 600 mm tracked siege mortar, and the Leopold and Robert 320 mm railway cannons. ^ "bunkierv3". infoturystyka.net.pl. Retrieved 9 June 2008. Henshall, Philip (1985). Hitler's Rocket Sites. Philip Hale. ISBN 0-7090-2021-X. Irving, David (1964). The Mare's Nest (PDF). London: William Kimber and Co. ISBN 978-1-872197-22-7. Wood, Paul; Ford, Roger (2000). Germany's Secret Weapons in World War II. Zenith Imprint. pp. 117–19. ISBN 0-7603-0847-0. Zaloga, Steven J.; Johnson, Hugh; Taylor, Chris (2008). German V-Weapon Sites 1943-45. Oxford: Osprey Publishing. ISBN 978-1-84603-247-9. L'artillerie à l'exposition de 1878. Paris: Berger-Levrault. 1879. Retrieved 29 June 2011. Birnie, Rogers (1907). "The multicharge gun". Gun making in the United States. Washington: Government printing office. Retrieved 28 June 2011. Haskell, James Richard (1907). "Discussion". In Birnie, Rogers (ed.). Gun making in the United States. Washington: Government printing office. pp. 121–124. Retrieved 28 June 2011. "The Lyman Accelerator Gun". Van Nostrand's eclectic engineering magazine. 3. D. Van Nostrand. 1870. pp. 658–659. Some time back we referred to the construction of the gun known as the accelerator in which a series of chambers were arranged at the side of the bore for containing charges of powder which exploded in succession as the projectile moved along it towards the muzzle until the combination of the charges exerted their full force upon the base of the shot to throw or propel it. The gun tried was of small calibre about 4 inches (100 mm) in diameter and this succeeded beyond the expectations of the company who were present to witness the trial. The success of the small one led the gentlemen interested in its production for field or battery purposes to endeavor to have one of a large size cast. Of course many difficulties had to be overcome before they could venture to make the world acquainted with the fact that a large one was in hand but after several failures mainly due to unforeseen circumstances they have had one cast weighing 10,175 pounds (4,615 kg) and measuring 11 feet 6 inches (3.51 m) in length. This gun was tried in the United States a few miles below Reading Pennsylvania on the old proving ground. Bull, Stephen (2004). "V3". Encyclopedia of military technology and innovation. Westport, Conn: Greenwood Press. p. 282. ISBN 978-1-57356-557-8. "Warfare's new weapon; casting the first of Lyman-Haskell cannon" (PDF). The New York Times. 25 October 1881. The first large cannon constructed on the accelerating or multi-charge principle and to be known as the Lyman-Haskell gun was casted today at the foundry of the Reading Iron Works. Lyman Holley, Alexander (1865). A treatise on ordnance and armor. D. Van Mostrand. pp. 885–886. Porezag, Karsten (1997). Geheime Kommandosache: Geschichte Der "V-Waffen" Und Geheimen Militaraktionen Des Zweiten Weltkrieges an Lahn, Dill Und Im Westerwald. Verlag Wetzlardruck. ISBN 3-926617-20-9. United States Army — Ordnance Dept (1884). Report of the Chief of Ordnance to the Secretary of War. Government Press Office. Pallud, Jean-Paul (2003). "Le Bunker de Mimoyecques — Hochdrukpumpe". 39/45 Magazine (in French). 197: 44–57. ISSN 0761-7348. Hogg, Ian V. (2002). German artillery of World War II. London: Greenhill. ISBN 185367480X. This page was last edited on 19 February 2019, at 13:30 (UTC).